The strongest evidence exists for Broadman Area 25 as target for deep brain stimulation in treatment resistant depression. This area in the brain is depicted in te figure above and is from the most important publication about DBS and depression in Neuron march 2005 by Helen Mayberg. Functional neuroimaging as well as antidepressant treatment effects suggest that this area plays an important role in modulating negative mood states. A decrease in activity is reported with clinical response to antidepressants and electroconvulsive therapy (ECT). Suggestions of other brain localizations for treatment with DBS for depression comes from case reports with DBS for other indications than depression. In a case report of a 56 year old patient with obsessive compulsive disorder and major depression suggests that deep brain stimulation of the ventral caudate nucleus could be a promising strategy for treatment of refractory cases of both OCD and major depression. The caudate nucleus is depicted in the figure below. In another case report DBS was used to treat severe tardive dyskinesia in a patient suffering from major depression. DBS was performed bilaterally in the globus pallidus. The dyskinesia as well as the depression improved substantially. In another case report deep brain stimulation was used for treatment resistant depression in a patient with borderline personality disorder and bulimia. Stimulation was targeted bilateral with eight-contact electrodes of areas at and around the inferior thalamic peduncle. 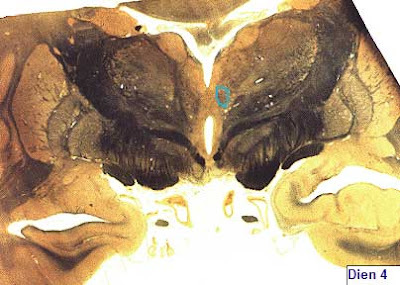 The inferior thalamic peduncle is depicted in the figure below with a light blue circle. There was a good effect on depression. Depression improved progressively over a period of eight months to normal level. On an Off period of stimulation the depression took a fluctuating course. Therefore the authors were not able to prove that the electrical current induced the beneficial effects. Complete return of depression in an Off period would have. Bulimia did not subside with DBS. Since these are case reports possible influences by placebo effect or other explanations for success can not be ruled out and these results should be interpreted with caution. Nevertheless since the authors usually select the targets based on hypothesis of function and relationships with depression further research on these techniques should be used in an extended study with treatment resistant depression. Two other area’s are suggested in two publications in Medical Hypotheses in 2006 and 2007. 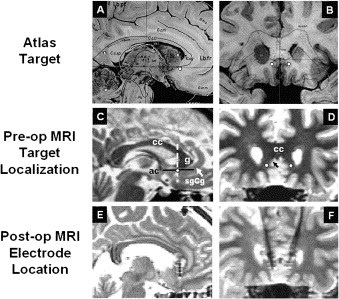 Broadman area 24a and the lateral habenula are suggested in these articles as targets for deep brain stimulation for treatment refractory depression. The habenula is depicted with number 5 in the figure below. Both hypotheses are based on findings of clinical imaging studies, animal models, SPECT and PET scans. Med Hypotheses. 2007;69(6):1305-8. Epub 2007 May 10. 2: Kosel M, Sturm V, Frick C, Lenartz D, Zeidler G, Brodesser D, Schlaepfer TE. tardive dyskinesia in a patient suffering from major depression. J Psychiatr Res. 2007 Nov;41(9):801-3. Epub 2006 Sep 8. Fabrigoule C, Bioulac B, Tignol J, Burbaud P.
Deep brain stimulation for OCD and major depression. Am J Psychiatry. 2005 Nov;162(11):2192. No abstract available. 4: Schlaepfer TE, Lieb K.
Deep brain stimulation for treatment of refractory depression. Lancet. 2005 Oct 22-28;366(9495):1420-2. No abstract available. stimulation in the inferior thalamic peduncle. Neurosurgery. 2005 Sep;57(3):585-93; discussion 585-93. Deep brain stimulation for treatment-resistant depression. I’m a trial patient in St. Jude’s DBS study for TRD and scheduled for surgery next week. I’ve started a blog – though I don’t really know what to say on it. Thanks for your blogging and explanations on your website.